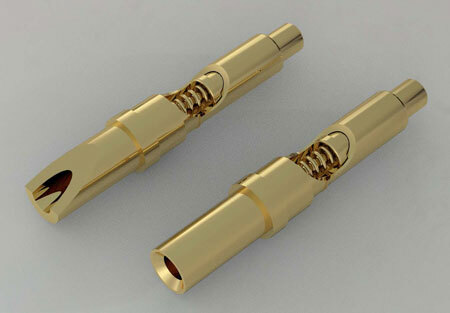 For customers looking for a spring method to connect a spring-loaded connector to a wire or cable, Mill-Max is pleased to announce two new wire termination spring-loaded pogo pins. Mill-Max's 0962 spring pin offers the advantages of both a compression spring connection on one end and a wire termination on the other. The .042" diameter plunger performs with the same typical reliability Mill-Max customers have come to expect with any of its spring pin products. Rated at 100,000 to 1,000,000 cycles, it is as robust as any spring pin offered anywhere. It has the unique feature of a crimp-barrel tail that can accommodate stranded or solid copper wires up to 24 AWG Max. / 28 AWG Min. Plated with 20µ" of gold over nickel on each precision-machined component and 10µ" of gold over nickel on the beryllium copper spring, the 0962 is as durable as it is multi-faceted. If soldering is preferred, Mill-Max's 0933 is the perfect choice. With all the reliability characteristics of the 0962, the 0933 has the proven solder-cup design utilized by numerous Mill-Max pins and receptacles and can accommodate up to 24 AWG Max. stranded wire or solid copper wires. Mill-Max also offers the ideal complement to the 0962 and 0933 spring pins. Our Wire Termination Target Pins act as both a mate to the plunger of the 0962 / 0933 while also offering a wire termination feature on the back end of the pin. Mating the 0962 / 0933 with these target pins turns a pair of discrete wires into a highly-reliable spring-loaded interconnection.